Located in Kaş, Hotel Club Barbarossa is by the sea, a 1-minute drive from Cukurbag Peninsula and 6 minutes from Kas Amphitheatre. This 4-star hotel is 14.8 mi (23.8 km) from Kaputas Beach and 2.5 mi (4.1 km) from Kas State Hospital. Make yourself at home in one of the 46 guestrooms featuring minibars. Rooms have private balconies. Bathrooms have bathtubs and hair dryers. Conveniences include safes, and rollaway/extra beds can be requested. Andifli Mah. Ibis Çikmazi Sok. Located in Kaş, Diva Residence Hotel is by the sea, a 1-minute drive from Cukurbag Peninsula and 8 minutes from Kas Amphitheatre. This beach hotel is 15.4 mi (24.8 km) from Kaputas Beach and 3.1 mi (5 km) from Kas State Hospital. Make yourself at home in one of the 19 air-conditioned rooms featuring minibars. Rooms have private balconies. Complimentary wireless Internet access keeps you connected, and satellite programming is available for your entertainment. Bathrooms feature showers with rainfall showerheads and designer toiletries. The hotel enjoys a quiet location on one side of the Kas peninsula, approximately 6 km from the centre of Kas where guests will find restaurants, bars, shops and the bus station. There are links to the public transport network in the immediate vicinity. Demre is approximately 42 km from the beach hotel, Kalkan is around 27 km away and Antalya is roughly 185 km away. Dalaman airport is approximately 152 km from the hotel and Antalya airport is around 195 km away. Built in 2011, this brand-new, stylish hotel of only 18 suites is situated on the side of a rocky outcrop over-looking the Mediterranean. The air-conditioned hotel consists of 2 buildings built in 3-storeys with a villa style, and it welcomes guests in a lobby with 24-hour reception and check-out services, a hotel safe, currency exchange facilities, a cloakroom and lift access to the upper floors. Further facilities include a bar, restaurant, wireless Internet access (fees apply), a car park, and room and laundry services (fees apply for both). The suites are furnished and decorated in a modern and contemporary style and 16 of the 18 suites have their own outdoor pool with decked sun-bathing terraces. Amenities include air conditioning, a minibar, tea and coffee making facilities, and a lounge area with satellite TV and Internet access. Each suite additionally features an en suite bathroom with a shower, as well as a double or king-size bed, and a private balcony or terrace. Other in-room amenities include a hairdryer, direct dial telephone, a safe and ironing set. 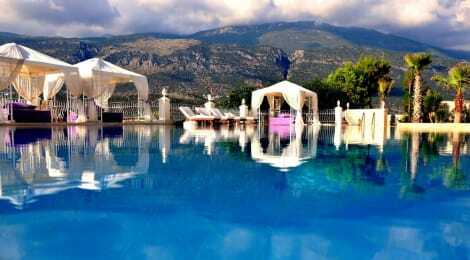 Located 700 metres to the seafront, Kas Artemis Hotel has an outdoor pool and free Wi-Fi. It offers air-conditioned rooms with a balcony. The rooms at Kas Artemis Hotel come with simple furnishings. They all feature a private bathroom. Some rooms offer sea views. Daily breakfast is served in buffet style. You can enjoy your meals indoors or in the garden. The bars serve refreshing drinks. The pool area is ideal for relaxation and sunbathing. The front desk is available 24/7. You can also benefit from the airport shuttle service offered at a surcharge. Less than 300 metres to Kas Bus Terminal, Kas Artemis Hotel is 25 km to Kalkan town centre. Antalya Airport is a 3.5-hour drive away. Make yourself at home in one of the 30 air-conditioned rooms featuring minibars. Rooms have private balconies or patios. Complimentary wireless Internet access is available to keep you connected. Private bathrooms with bathtubs or showers feature complimentary toiletries and hair dryers. With a stay at Lantana Aparts in Kaş, you'll be near the beach, just a 3-minute walk from Small Pebble Beach and 6 minutes by foot from Ataturk Statue. This apartment is 13.1 mi (21.1 km) from Kaputas Beach and 0.5 mi (0.8 km) from Big Pebble Beach. lastminute.com has a fantastic range of hotels in Kas, with everything from cheap hotels to luxurious five star accommodation available. We like to live up to our last minute name so remember you can book any one of our excellent Kas hotels up until midnight and stay the same night.